First Aid and Medical considerations are among the basic essentials to address for one’s overall general preparedness, even Level-1. Unfortunately, in this category most people will not think about it until they actually need it! The problem with that of course is that it is too late “after the fact”. There are a few simple things that you can do while setting aside just a few minutes of your time so that you will be ready in this category for “just in case”. I have written a number of articles here on the blog regarding this. 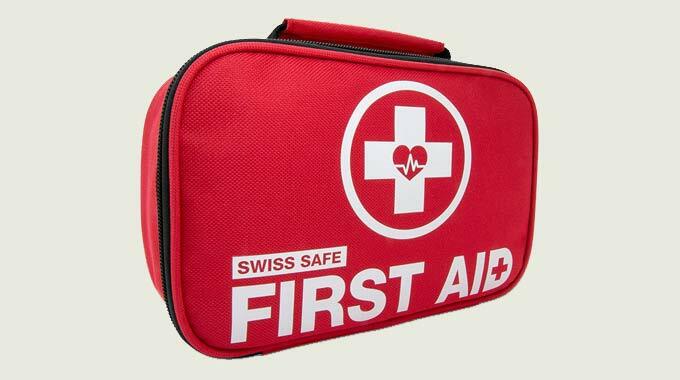 Browse through the First Aid categories and search this site for more detail. That said though, a quick and easy way to minimally prepare yourself is to simply purchase a few basic First Aid supplies. Consider purchasing a basic First Aid Kit. Then you might simply augment those items with whatever else you feel is important. Regarding medical preparedness, I included this separately for you to consider your own medical needs, whatever they may be. Try to stock up a bit with the medications you may be taking. Simple as that. Order refills before they’re empty and you can “game the system” to an extent and build up a supply. Also, consider learning some basic First Aid skills. Since this is only Level-1 preparedness I’m not going to go into this in detail (that will come later), but learning a few simple procedures will benefit your overall knowledge and readiness. I have few similar 250 piece medical kits to Ken’s link. One in each vehicle for travel, one stowed in the emergency bin (grab-n-go), and two in the house (one upstairs, one down). Two smaller kits are in each GHB. And no, I’m not made outa money, picked them up over a year, then crossed them off the list. Something to consider when building first aid kits is when and why they are most likely to be used. For example, I make sure that each kit has Sting-eze when summer rolls around, and I remove it in the winter. The kit that I keep in my bike bag has an irrigation syringe for cleaning “road rash”. I used to only have one kit that I would keep changing the contents of depending on the season, activity, etc. Now I have several in various places that are more function specific. Another good habit is to check the contents to replace items that may have been used. If​ I used some bandages on a hike, I try to remember to replace them when I get home so that it’s always “pack ready”. I will admit that sometimes the post-trail beer makes me forget so I always check my gear before heading out. For hardware like the curved forceps, I have found them readily available at the farm and ranch stores where the veterinary/equine supplies are to be found. Thanks for the tip to procure professional grade tools from the farm stores. Everything else always seems to be junk from china. CaliRefugee, the first aid kit in my bike bag really is a level 1 kit. It’s designed to deal with “just enough” to let me finish my ride and get home safely. Drinking water from my pack is good enough for the initial irrigation. When I get home, then I do the more thorough debridement with Hibiclens and “properly” dress the wound. If I am planning on being out for days, then the more sophisticated (level 2) kit comes with. If I am going to a truly remote area and engaging in high-risk activities, the full “jump bag +” is with. I’m really glad that Ken is getting back to his Level 1-4 series. I’m really looking forward to delving into some of these issues beyond the basics, although I know that is important as well. Do not forget the no sting spray to use for the skin scrapes of small children. I used to carry an aerosol can of Bactine on my ambulance because no parent wants their kid to be hurt by the ambulance driver spraying on disinfectant and I’ve heard enough kids screaming to contribute to my high frequency hearing loss over the years. Many posters out there are now taking care of children and grandchildren. (ie. Bill Jenkin’s Horse) so I hope they find this useful. Like Grey, I started with something like the 250 piece kit as a basis, Put it in an M3 Medics bag and started customizing from there. 2). I keep the medications for each back in a zip lock bag in the kit and like any stock, ROTATE them! Don’t wait for them to expire! I used to use ‘restockmykit’ (I just checked and it seems to have gone away…) but found I could get the same prices at amazon. One of the first things I learned when I started prepping was first aid and what to do in an emergency. Well it paid off last summer. My wife and I have friend that was born with a weak heart we hadn’t heard from her in a couple of days and something inside me said GO OVER THERE RIGHT NOW IT SAID DO NOT WAIT! GO RIGHT NOW! So I followed my gut and did go over. When I got there her face WAS GREY she was breathing like she had RUN A LONG WAY. Her skin was clammy and she couldn’t get her breath. I did not fart around. I called 911. Right then she whined she didn’t want to go but the EMTS told her heart rate was WAY to fast, it was 175. Whining the whole way she went anyway. The next day while in the ED her heart crashed she died twice on the table. She had to have heart surgery RIGHT THEN! She did and she lived to tell about it she still tells others about it. I made up my own first aid kits. They have everything from band-aids and cough drops to blood clotter and Benadryl. I have a kit in each of our trucks and one in the house. Benadryl and aspirin are very common drugs that have very good life saving benefits. Aspirin is good for heart attack and stroke and Benadryl is good for anaphylactic shock. I am mildly allergic to bee stings so Benadryl has saved the day several times. @Anonymous, thanks for the memory jog, there is a small bottle of low dose aspirin in each vehicle in case of a possible heart event. Kept within arms reach. Band aids are for girls just rub some dirt in it… That will stop the bleeding. I have a 5 gal. bucket at home exclusively for wound care. Peroxide, pads, non stick, gauze, self adhesive bandage wrap. Staph infections on simple wounds will be the biggest killer in shft. You are DEFINITELY beyond Level-1 in that department. Excellent! Dh just slaps a piece of Duck tape on an injury until we get back then properly cares for the injury. “Band aids are for girls”? ! Not fair. Keep something to use as a garbage bag in with your kit items. A place to put used first aid material to dispose of afterwards. Especially helpful for car/truck kits. I would also add a few packs of pure real sugar to anyone suffering from low blood sugar with diabetes or hypoglycemia. Shepherdess, a used nitrile glove turned inside out can be stuffed with medical trash then tied in a knot at the cuff to keep it contained. Ziploc bags work great, too. The Ziplocs can be used to keep everything organized in the kit, then used for the trash. Replace with a fresh Ziploc when restocking the kit. I do carry glucose tabs for my hypoglycemia in most of my first aid kits. I have gotten really good at recognizing the warning signs and control it through diet so it’s not part of my EDC anymore. In our 17 years together, I have only gone into hypoglycemic shock once. I don’t want to put him through that again. I think he was worse off than I was! Sugar packs I do not have in bag, thanks for the information. Sugar packs are also useful for packing wounds. The sugar helps prevent infection and speeds healing. Heard about this from Liz (retired doctor) over at Underground Medic. Tried it on my DH’s wounds and darn it all, it works. Good afternoon everyone, I too am very happy to see Ken get back into the “Prepping and Preparedness” levels, Thanks Old Man. Well, first I understand that this is a Level 1 article. But, and there is always a “But”, please do NOT skimp on a First Aid Kit, I know a few dozen simple POS kits that were cannibalized into an Excellent ‘Usable’ Kit. Yes; if you have nothing as of yet, by all means start with one of the Kits that Ken suggest, but please don’t think by any means that’s a catch all, I’m confident that Ken will elaborate more, just don’t get upset when he/we suggest a few dozen (hundred) additions later. Honestly with all the Kits I have had over the past 300 years, I should have just purchased a HUGE Trauma, Medivac, (as White Cracker said), “full combat blowout kit”, INCLUDING the Kitchen Sink. Expensive for a one time purchase? You bet it is; but how much is it worth to have the means to save a life? How much did you spend in Starbucks Coffee this week? And I KNOW how much 0ldhomesteader spent on Tea and Chocolate…. OK, back to earth for a bit, if you decide you cannot afford $85,273 for a First Aid Kit, here is just a few items I would add to one of Ken’s, yes even for a level one kit. 2. A few Plastic Bio Bags for the nasties. Read it BEFORE you need to patch someone up. 4. Drugs, everything you need to keep your heart pumping, as Ken said, steal them if you have to. Remember if/when TSHTF, what ya going to do then? 5. A bottle of Moonshine or whatever…… use your imagination. 6. Could list a hundred items, but do your homework, GET IT DONE! 7. A roll of TP, ahhhhh come on, I HAD to say that…. HAHAHA, but honestly it has a LOT of uses, even something to cry into when you need it. Last thing I have to say, the Medical/First Aid Kit will do you NO good if it’s at home, you’re at work and you’re around a Big-A-Bad-A-Boom. I could go on, but that’s my 2¢ worth of the $84.92 I have to say. Not to be a cheapskate or anything, but especially if you have multiple first aid kits I find the Dollar Store can check quite a few boxes at a dollar a pop: antibiotic, benadryl, hydrocortisone, peroxide, band aid, gauze, denatured alcohol aspirin (100 for a buck: I just paid $7 for a pack of only 10 aspirin in Switzerland last month, yikes! ), vicks equivalent, tums (or kaopectate) and more. Then they have scissors, tweezers and other hardware. Worth checking out at least…. Our local pharmacy has a silver solution, in a tube like a cream, put out by Curad… very good for wound care. about 5$ for half an ounce. very good anti infection. Re: dressings you will need at least 20 times more than you think you need. Feminine pads are very absorbent and come in a good range of absorbency and thicknesses. The single wrapped ones are sterile. Generics work well. and save money big time. Been there,done that. paper tape – lots of it for tender areas, that require tape. (and coban not practical). .. absent tape, some areas could require a long cloth/to wrap on top of a dressing to hold in position and a single piece of tape/or safety pin… not easy to secure or do. Get the tape now Have a back up. Don’t forget the nausea meds, and allergy meds.. injectables if anyone in family or MAG needs them,, Benadryl liquid works faster than capsules. To make capsules work as fast as possible…, can take them with a drink of cola/warm coffee or break them open and put in a bit of honey or jelly.. can also place under the tongue for faster response this way. I hate paper tape. There is something much better known a ‘micropore’ tape. It lets the skin breathe and doesn’t debride the skin when you take it off. It also is easier to tear and apply. Lots of good stuff from everybody. I guess the point to remember is this is level 1. For long term you are going to need a LOT more, Adventure Medical Kits should be looked at for at least a good idea of what things might be needed. Their Marine 3000 is their top of the line and IMHO would be a good starting point. At close to $800.00 for the kit it isn’t cheap but probably many of us have spent a lot more on other categories. Start small and as you can afford add to it. Use the list of contents as a idea of what you need. Cleaning a wound takes a lot of gauze pads and sterile 4x4s aren’t cheap. Non-sterile (clean) pads are much cheaper and okay for cleaning. Water can be sterilized by boiling but can be somewhat caustic on open wounds, learn how to make it into saline solution. Hydrogen peroxide outgasses the extra oxygen over time (H2O2) and turns into water. If it doesn’t cause blood to foam it’s getting very dilute. Dakin’s solution is also good to know how to make but you will need bleach which unfortunately also goes bad over time. As mentioned above lots of good things to be had at the dollar store. Another place to look is eBay. Doom and bloom with Dr. Bones and Nurse Amy should also be looked at. When my wife and I were sailing other cruisers would show us their kits. Most of them thought were very well prepared. They weren’t. Dr. Bone & Nurse Amy just did and article on Dakin’s solution an how to make it. Recipe is also in their book. I have had CPR, defib, blood borne, and other first aid classes for work as it is required every two years. I have to take it next week, now that you brought it up here. Some classes are free and some for a small fee. Good to know. I worry about “level 1” first aid utilizing butterfly closures. Deeper wounds need to heal from the inside out. Putting a butterfly closure on them might encourage a deep abscess. Beach’n, Level 1 definitely implies that this is First Aid, not long-term care. Butterflies are easy to apply and can help keep a wound closed until the patient is brought to a person/place to receive professional treatment. Hi all ,,,just some thoughts that I hope are close enough to keep the Ken guy happy. First off those of you near where there are yachts and boating search out the shops that repack the liferafts and ask for the out of date med packs, out of date you say? Well most of the things in a med pack will far out last us. I have med kits from WW2 lifeboats that are still in good condition, sealed in tin cans of the time. Also while I’m at it I have found bankruptcy auctions a good place to find industrial strength first aid equipment, a pallet of first aid kits/boxes (50 or so) for 10 dollars or a defibrillator for 20 dollars or a stretcher in a metal wall box for 2 dollars or boxes of exam room supplies (a pickup truck load) again 20 dollars. Point is you can find this stuff and not have to spend a lot. If cared for most of the ‘hard stuff’ will be usable long after yours and mine expiration date. Ice tea and biscuits and of course some chocolate too. I was surprised to see the very First Aid Kit I carry in my car pictured in the article. The only thing I added to it was two Bic Liters. Just seemed like a good place to stash them as there are alcohol wipes in there for bad weather fire starting. Wow, for once I think I am ahead of the curve. Each car has a “basic kit” and has had for years. When I was in 5th grade, (I’m not telling how long ago that was) I was with my parents and witnessed a truck – motorcycle accident. It was a bloody mess! My dad had “acquired” a WWII medical bag and just happened to be carrying it in the car, He grabbed it and with skills taught through military flight school got the bleeding stopped, treated the cycle rider for shock and splinted a broken arm. When the medics arrived, about 30 minutes later, they loaded the guy in the ambulance and away they went. Didn’t have much else to do at the scene because daddy had done it all. I decided then and there that I would always carry a first aide kit of some kind with me, starting then. Dad helped me put together a few things in an old tobacco can and I used to take it where ever I went. No I couldn’t have done what my dad did but I started learning and today I have a first aide kit in each car and a full fledged med-surg kit that goes with us when we travel. I put it together myself and stocked it with items I know I could use if I had to. I am also the medical go to in our area if we have a disaster without medical availabity. I know there are those who can’t handle the sight of blood, “my oldest son being one” but keep in mind you may be all that’s standing between some one you love bleeding out or living. Get prepared and buy raw liver to play with, might make it easier if you have to get the bleeding stopped. We have several first aid kits, but my favorite is my bucket that I put everything together in for travel. I still have small units with a few items but my go to is this storage unit. Decided I needed something most would never think of having medical supplies in it….plastic cat litter container. Provides a wide variety of supplies that I can have on hand for what ever might arise, including extra reading glasses(cheaters). I keep a list of what each bucket contains, and time to rotate the latex gloves as the heat deteriorates in a short space of time. Even if they are vacuum sealed. Don’t forget some Quikclot sponges for big cuts, super glue to hold things together, feminine napkins for dressings, gorilla tape to hold it on and some Dr. Naylor Blu-Kote spray for wound dressing. One thing I always have on me is a charged cell phone so that I can call 911 if required, assuming it is a normal situation, not shtf. At work they are making us take mental health first aid, which covers suicide, addictions including alcohol and drugs. With all due respect if any of this sort of thing occurred I would call 911, and try to distance myself from it. As an older single woman I put my own safety first and have had to distance myself from other bad situations. I would offer a decent stranger bandaids, sunscreen at the pool, etc. but I would not apply these items for them. I do a lot of swimming and my duty does not extend beyond notifying the certified lifeguards if I notice danger. I try to stay away from people on drugs and I fear them. Today with so much road rage, drivers under the influence, violence against innocents, home invasions, gun shootings in city parks and elsewhere, my duty does not extend to the general public. I will however distance myself and call 911. As an RN, I knew that a good first aid kit was a priority, especially as we live 30 minutes from the nearest ambulance and 60 minutes from even the most basic trauma center. I went to Harbor Freight and bought a sturdy tool box. I supplied it with various dressings, chlorhexidine solution (better than betadine with a 72 hour surface kill time and fewer allergic reactions to the iodine), I have betadine solution to use in the case of nuclear exposure, kotex, ointments, basic meds and gloves. Because much of our property is inaccessible to vehicles, I found a strong (up to 350 lbs) soft stretcher to move a patient if needed. I also bought a length of SAM splint and a portable Field Guide to Wilderness Medicine. There are a number of other things in the box, too. Butterflies, scissors, gauze, medications. Another thing I have done is identify which of my grandchildren has the right constitution to be a ‘junior health and safety officer’ of the group. This gal is calm in an emergency and naturally jumps in to assist any of her cousins who need help. She is my helper. That’s very interesting to know. I checked on Amazon and all their product indicates for pets, horses, etc… Are there different solutions of chlorhexidine for humans? “Hibiclens”. Can buy it at the drug store. Used by patients to bathe in before surgery, etc. It’s a chlorhexidine soap. Thanks for the information. I will be purchasing some of this. Walgreens also has a house brand that’s more than half the price. I got two bottles before back surgery. Sorry, it’s been a busy week at work and I just got a chance to check my MS blog…. I use the Hibiclens brand. It’s been used in hospitals for many many years as a surgical scrub. Surgeons use it to ‘scrub up’ before going into the OR suite. Our hospital uses it for a skin prep, IV insertion prep and lots more. Only one caveat – don’t get it in your eyes. It is very damaging. Get at least a 4% solution. Many of the solutions sold on Amazon are 2%. Last note about an important topic – Leave some type of record for Paramedics within your home for possible event that you go down or unresponsive for older people living alone. (AMPLE survey: Allergies to medications and substances, Medications you are currently taking, Previous illness or chronic condition including seizure disorder, Last meal consumed and Experience prior to crashing or losing consciousness). People get upset or offended about strangers going through their homes looking for clues when they are incapacitated. This is why I recommend placing this info on the fridge in the kitchen. It prevents the Paramedics from doing an easter-egg hunt for clues to your unresponsiveness. Has anyone of surgical glue. We were snow camping in the Mountains and one of the medics (used it on a few guys who managed to get a few holes in them (will not elaborate). It worked great…is there a civilian version and name? –	For a long time (many years) I was one of the guys you got when you called 911. My “at-home” kit occupies all of one of those 5-drawer plastic chest-of-drawers from Walmart. That’s not including the stuff in the bathroom cabinet where the kids can get to it. Each of my vehicles has a kit that began life as the equivalent of the required kits for German-registered autos. They have been added to over several years, and probably the most exotic items are small ‘button’-type flashlights in each. Each has a pair of tweezers, a pair of bandage scissors, and a pair of curved mosquito forceps. I have access to disposable ones and an autoclave, so I can recycle the things. They are about the same quality as the ones from the vet section of the local feed store. I do include Dermabond, which is the surgical glue Donald asked about. You will need a prescription for it. There is a much cheaper version available as veterinary equipment. Which works fine for humans, too. I’m sorry, I’ve lost the name of the stuff. You can use regular super glue; just be aware it will sting for a moment, unlike the Dermabond. A common use for it is to apply butterfly ‘stitches’. I also have several smaller individual first aid kits located wherever I think they might be useful. Hope this helps. My small travel first aid kit always has Dioralyte in it, it replaces electrolytes and helps stabilise things after that dodgy stomach has cleared you out. Also put in a couple of sachets of saline for eye irrigation. To get experience of dealing with injuries, you can always do volunteer work with the Red Cross, providing first aid cover for events. Just remember items to take care of your best mode of transportation, your feet! Moleskin, foot powder and anti-fungal cream. A few extra bucks to literally keep you going is a small price to pay. Greetings Don, You are correct that step #1 within a burn center is to scrub with soap and tap water. Beyond that, most procedures are done using sterile water and normal saline (also sterile.). Having worked as a CNA on a burn unit for over 2 years, cross contamination and destroying somebody’s newly seeded skin grafts are sure ways in which to get yourself fired. I don’t know if some one has mention it but cling wrap is handy for your FAK, I use it to cover burns as a sterile skin. Sulfur powder is great for burns but make sure the person is not allergic to sulfur.